I probably shouldn't take on a Nobel Laureate who got his prize for his work on trade, but this truly scares me. People pay attention to this nonsense, including the five senators, led by Schumer of New York, who want to start the process of targeting China. Aug. 25, 2015, 3:41 a.m. 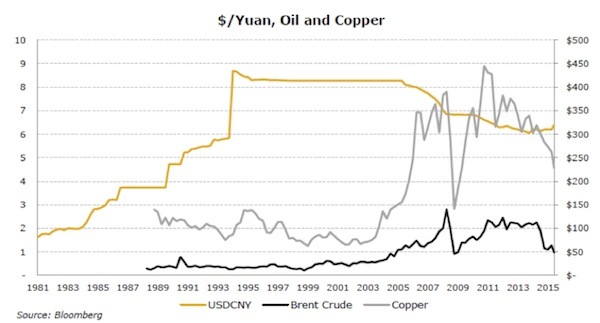 The difference between China currency manipulation and the other central banks is that China does it directly with that being their stated objective within a given band, whereas the other central banks do QE etc. to stimulate the economy, aim at a specific inflation rate etc., with the currency weakening being a by-product. It is still free-floating and not forced within a certain trading range. So yes, China is still manipulating their currency while the others are not. Aug. 22, 2015, 10:40 p.m.
Another interesting and insightful article. I can’t imagine any of your readers actually believing any of Trump’s prattle, sadly he and those presidential wannabes who follow his line of thinking are preaching to the naive, or just plain ignorant, who live in a bubble, usually of their own making. As you point out, they need an external “enemy” on which to blame perceived problems and the politicians are only too quick to give them one. Never mind the facts. My Chinese friends are always warning me, when we discuss these issues, not to under estimate the ability of the Chinese government to suddenly change the rules and force a change in direction for the economy. This article made me think “what if this time, or some time in the near future, they can’t?”. That the economic and resultant social system gets beyond their control? Aug. 22, 2015, 6:01 p.m.
Why zero in on Trump? He’s being a populist; so what? Then I would vote for them. But NO ONE except Donald Trump is telling Americans the explicit things we want to hear. Answer this question: do you think Donald Trump would be any worse than the current gaggle of politicians in either party? I for one am damn tired of hearing their watered down pablum — and being repeatedly double-crossed by the people I voted for. People were attacking Ronald Reagan at this point in the 1979 - 1980 campaign: It’s “Bedtime for Bonzo”, he’s a “Hollywood actor”, etc. Reagan was the best President in the past fifty years, if not the past century. What makes you think Trump wouldn’t be a good President? What makes you think anyone else would be any better? For certain, almost all of them, D’s & R’s, would be worse. Aug. 22, 2015, 11:40 a.m. The profit equation from Kalecki and a quick regression will show that for every dollar that the trade deficit takes away in profits, the US govt replaces with govt debt and housing bubbles. The trade deficit takes away 60% of profits in the US which must be replaced our we have a depression. I would think that if a person wanted responsible govt, limited govt debt, and economic freedom that they would want balanced trade. There is a solution that enforces balanced trade without punishing trade and doesn’t require surrendering to money printing. For more information you can add “Where do Profits Come From? The Road to Economic Prosperity” to your reading list.